Avalon Waterways has revealed details of two stylish new ships set to cruise the rivers of South-East Asia from next year, including its first cruises to the incredible ancient temples of Myanmar. The ships are profiled in Avalon’s newly released 2015 Asia brochure, its first brochure dedicated exclusively to its exotic itineraries on the mighty Mekong, Yangtze and Irrawaddy rivers. To mark the brochure’s release, Avalon is offering savings of up to $758 per couple on its 2015 World Collection cruises, with a discount of five per cent on all Asia bookings until June 24, 2014. Avalon’s two new Asian ships will bring the same levels of style and comfort offered aboard its successful Suite Ships in Europe, but in a smaller, more intimate vessel. Both 60-metre ships will offer just 18 suites, all fitted in contemporary Asian style with wall-to-wall panoramic windows that slide back to create an open-air balcony. The first, Avalon Siem Reap, will be deployed on the Mekong River in January and will operate Avalon’s 13-day itinerary between Ho Chi Minh City and Siem Reap – Fascinating Vietnam, Cambodia & the Mekong River. The second, Avalon Myanmar, will cruise on the Irrawaddy River from September in a brand new 14-day itinerary beginning and ending in Yangon – Golden Myanmar & the Alluring Irrawaddy. Both ships feature a stylish air-conditioned Panorama Lounge with floor-to-ceiling windows to maximise the views, a shaded open-air observation lounge on the forward deck and an intimate timber-floored dining room serving fine contemporary cuisine with a mix of western and Asian styles. Other features include a bar, a spa treatment room, a fitness centre and a library. 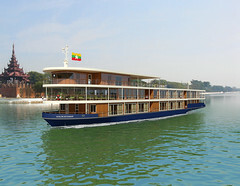 Avalon’s Myanmar itinerary represents the newest destination in its worldwide selection of river cruises. Priced from $7691 per person twin share (including discount), it begins with two nights in the capital Yangon before flying to Bagan to join the ship and begin a 10-night journey along the Irrawaddy river. Highlights include sunrise and sunset visits to the renowned temples of Bagan and Mandalay, an opportunity to visit monks and present alms at an ancient monastery at Kya Hnyat, a visit to an elephant camp at Katha, plus dozens of other unforgettable experiences among the villages, traditional workshops, schools, convents, farms and markets of the Irrawaddy valley. Other itineraries in the Avalon Waterways 2015 Asia brochure include the 13-day Fascinating Vietnam, Cambodia & the Mekong River (from $4326 per person twin share, including discount), the 11-day Magical China & the Yangtze River (from $4229) and the 15-day Cultural China & Tibet with Yangtze River Cruise (from $5719). Avalon Waterways’ 2015 World Collection discount of five per cent is available for bookings made by June 24, 2014, and applies to all Asia cruises as well as Amazon and Galápagos cruises. *Prices per person twin share, subject to availability and conditions.